With the growing demand of mobile technology and people want to be online wherever they would go, Globe Telecom just launched a mobile portal that gives its subscribers access to the internet for free. 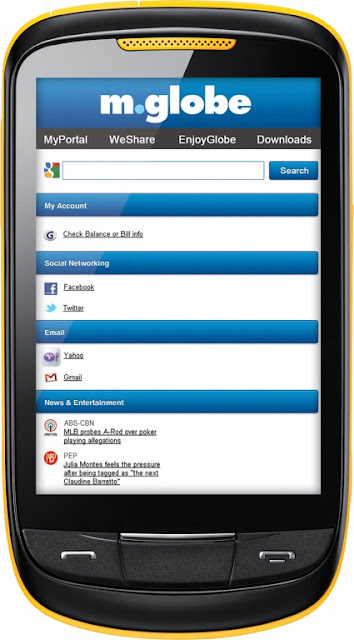 m.globe allows all Globe subscribers easy internet browsing by using just a single platform. You get to check and update your Facebook and Twitter accounts and check emails conveniently. No wifi is needed. Both Prepaid & Postpaid users can access the internet instantly. With just PhP1 load left for Prepaid, m.globe gives a wide array of online access, while the Postpaid subscribers will not get any extra charges. m.globe is just absolutely free! With m.globe, subscribers can access the internet with its various features like News & Entertainment, Email, Search Engines like Google. Users can also receive exclusive content like live streaming of sporting events, movie clips, the most downloaded songs and wallpapers. The m.globe portal is available to Android users through a neatly-designed widget. Subscribers using Samsung Galaxy S II, Sony Ericsson Xperia Arc and other Android phones with OS 2.1 onwards can enjoy the m.globe widget for free. I'm a postpaid & prepaid Smart subscriber for almost a decade now. With this new feature of m.globe which gives us access on the net absolutely free, I'm thinking now of switching to Globe - seriously! While access to m.globe is free, subscribers can also register to mobile internet promos to enhance their surfing experience. Globe has a variety of mobile browsing plans for every user, from Prepaid PowerSurf 15 which is available at P0.25 per minute, Postpaid PowerSurf 99 which gives users 50MB of mobile data for only P99 or the surf-all-you want plan SuperSurf 999 good for a month’s use. Text SURF to 8888 to know more about the different browsing plans from Globe. The best things in life are FREE! Start enjoying m.globe on your phone now by texting M.GLOBE to 2910 or visiting http://m.globe.com.ph to download the widget on your mobile phone.